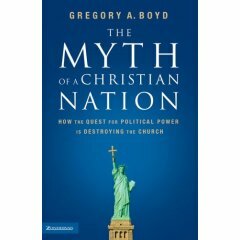 About two weeks ago I finished Boyd's book The Myth of a Christian Nation. I have intended to review it, but have chosen not to until now. I have needed some time to think about what Boyd has written. At the same time I have been reading a book entitled God is not ... religious nice "one of us" an american a capitalist edited by D. Brent Laytham. Both of these books have been quite thought provoking. I've made some comments in previous posts about both books. What I intend to do in the next couple of days is write a series of short posts interacting with both books. Hopefully short posts will be more readable than long ones. One of the things I find interesting is that Boyd thought that a sermon series that shrunk his church by 1,000 people was worth a book. Most senior ministers write books when attendance increases by 1,000 people as a result of a sermon series. But then Boyd has always thought a little differently. I believe a significant segment of American evangelicalism is guilty of nationalistic and political idolatry. . . . evangelicals fuse the kingdom of God with a preferred version of the kingdom of the world (whether it's our national interests, a particular form of government, a particular political program, ...) I believe many of us American evangelicals have allowed our understanding of the kingdom of God to be polluted with political ideals, agendas, and issues. A strong statement -- but one that I have by and large, discovered to be true among evangelicals across America. As a legal immigrant to the USA (I actually became a citizen last year) one of the first things that has become increasingly obvious to me is that the Kingdom of God and America appear to be one in the minds of the great majority of evangelicals -- and that by furthering America's agenda (political, economic or military) somehow we are also furthering God's agenda (after all, God is on our side). Disagreeing with the mixing of God and America makes one barely a Christian. My reaction to the mixing of God and America and the reactions of the minority of evangelicals that don't necessarily believe that the Kingdom of God and America are the same has often been wrong as well. In our reaction to the religious right we have often become interested in forming a "Christian left" -- distancing ourselves from the self-righteous right. By doing that, we have become self-righteous ourselves, and fallen into the same trap as the Kingdom of God = America folks. We have become caught up in the kingdom of the world. We have stopped asking ourselves -- not in a trite way -- but seriously "what would Jesus do?". If our task as Christians and the church is to represent Jesus, then we have to ask what that means in all areas of life. We need to ask, not what would Jesus do about illegel immigration -- but how wouyld He minister to illegal immigrants? The wrong question to ask about gay marriage is -- are you for or against gay marriage?-- but how are you ministering to people who are homosexual? What are you doing to help people in heterosexual marriages stay married -- in the church (where the divorce rate is 50%) and in the community? Our economic questions should not be about how can we make more money -- but how do we do business? Are we honest? Do we have integrity? Do we treat our employees with respect? Do we pay them what they are worth (not market value)? Are we using the finances God entrust us with to bless those in need, or are we building up treasures on earth? These, and similar questions are much harder to answer and do something about, than the questions we normally ask -- because they require us to DO the kingdom -- to FOLLOW Jesus. These are not questions that are easier to answer for the right or the left. So, I have determined, that when the polarizing questions arise -- I am going to try -- as hard as I can -- to avoid answering politically. Instead I am determined to respond by asking questions about what Jesus would do. How would He respond to the political issues of the day? And, by the grace of God, I will allow him to form my character so that I become less self-righteous, and more like Him. Loved the post Karl. I am one of those people that also has a tough time viewing politics and Christ's teachings as the same, definitely not capitalist. Great job, loved it. I think you are write to say Jesus isn't a capitalist, certainly Jesus holds none of the ideologies that control the world. But what do you meanwhen you say "Do we pay them what they are worth (not market value)?" This quesiton is inevitably a slippery slope. If we don't use productivity as a means for assessing one's wages what possibly could we use? Although Jesus isn't for capitalism, the other side of the argument (pay them what their worth) although there is no standard is simply a black hole. You will find my thoughts on this under the posts; "You Gotta Keep 'Em Separated", and "Contrast of God's Kingdom and Empires of the World". Keep up the good work- it's important!